Thread reads your scanned items, and searches for key text or data within to link these documents to your case files. 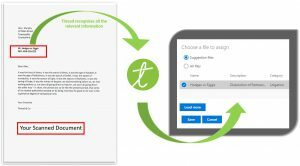 Once the text is recognized Thread will suggest the relevant file for the document. All you have to do is confirm this is where it belongs and Thread will direct it there for you.